Separately or in combination with any other wholesale item. Each Box of 18 - 2oz. Votives. An utterly brilliant recreation presented first by Claire Burke. seasoned candle maker can't distinguish between the original and the copy. infused with countless warm spices including nutmeg, clove and cinnamon. of my personal favorites since it's introduction to our line several years ago. 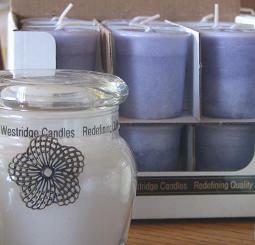 Extraordinary votives, elegant packaging, exceptional service! Wouldn't consider buying from any other source.